“Next week Monday, April 15th, M3 students from TN Tatem Middle School will report to Purvis Primary school; M2 students will report to Heron Bay and M1 students will report to the Hamilton Fire Station,” the Education Commissioner said. “Once the M1 and M2 students transfer the week of April 15th, the M3 students the week of April 22nd, and staff transfers are completed, they will all remain at their assigned schools until the end of June 2019,” the Minister said. This was stated at a press conference this morning [April 12] to provide an update on T.N. Tatem Middle School building, where problems have been ongoing due to the condition of the building. Minister Rabain said, “Today, I would like to provide an update about concerns raised regarding the TN Tatem Middle School building. “First, I would like to welcome the Commissioner of Education, Mrs. Kalmar Richards and Cabinet Health and Safety Officer, Mr. Titus Gordon. “In a media statement shared on Tuesday, April 9, it was stated that TN Tatem Middle School parent and staff representatives sent a letter to Ministry and Department of Education leaders – voicing grave concerns about the building and a request was made that testing be conducted in rooms and meeting spaces for air quality and levels of mold; and for repairs to be carried out. There was also a request for alternative learning venues to be provided. “In that statement, we reported that we met with representatives from the school on Tuesday afternoon and on Wednesday and Thursday of this week, students would report to Purvis Primary, Heron Bay or Paget Primary, based on their year level. We can report that these schools prepared for and opened their doors to TN Tatem students and staff, and we thank them for that. “We also stated that on Wednesday, April 10th, the Cabinet Safety and Health Officer would carry out inspections at TN Tatem on the morning of April 11, and conduct a training session with staff after school. We can also confirm that both of these actions did take place as promised, and that the inspection report will be completed by today, Friday, April 12. “Yesterday, Thursday, April 11th, we received another letter from the TN Tatem Parent Teacher Student Association. We were advised in that letter that the school representatives who attended the meeting with Ministry and Department officials on Tuesday afternoon, shared information from that meeting with the TN Tatem staff, and they also confirmed that some of their staff accompanied the Cabinet Health and Safety Officer when he carried out an inspection at the school, and that the Cabinet Health and Safety Officer did hold a training session with staff. “In that letter, there was also a repeat request to have all rooms at the school tested and to have the inspection report shared with staff on Monday, April 15, 2019. We agree to this request. “These requests from TN Tatem will require staff and students to remain out of the building next week from Monday until Thursday. Friday is the Good Friday holiday. This information will be communicated to parents as well. “I am sure that on hearing that students and staff are being transferred to other middle schools that you have questions about whether they will be returning to TN Tatem. I can confirm that once the M1 and M2 students transfer the week of April 15th, the M3 students the week of April 22nd, and staff transfers are completed, they will all remain at their assigned schools until the end of June 2019. “This government has not shied away from the infrastructure problems that have plagued our school system. We have shown our commitment by immediately conducting a Health and Safety review of all school buildings in October 2017 followed up with an additional review in September 2018. “As detailed in our press release in March 2019, steps to address issues at TN Tatem had been in place since the start of the 2018/2019 school year. These steps also included an independent Environment and Air Quality assessment which was received in February 2019. “We were very surprised that the summary of the report concluded that the same issues that had been identified in 2013 and in 2016, that resulted in the closure of the school, were the same causes for the problems we see today. More specifically, water intrusion issues. “It was assumed, and rightly so, that the recommendations in the 2016 report, which resulted in the school being closed, had been followed and the source of the causes of mold had been addressed. Sadly, this was not the case. However, based on the information now known, a plan was set in motion earlier this year to address the concerns from the 2016 report and subsequent follow-up report from February 2019. 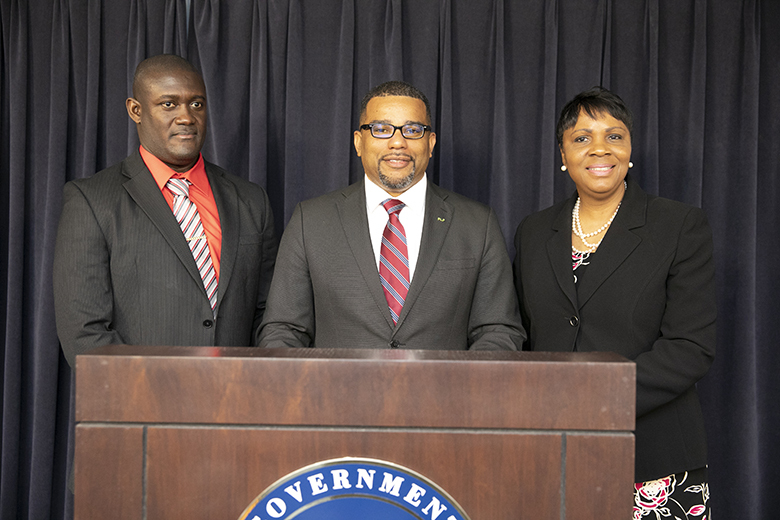 “The Ministry of Education and the Ministry of Public Works, as was announced on March 25, 2019, are developing a strategy to address the water leaks and other structural issues that had not been addressed since 2016. We will review reports, and determine the scope and extent of the work that must be carried out to bring the facility up to standard. “The bulk of these works have been scheduled to be addressed during the annual summer works for public schools. I would also like to at this time, give kudos the TN Tatem Health and Safety Committee who had already taken action to address issues within the school that fall under their purview. “Once we are clear about what is required, we will make a determination about whether that work can be successfully completed over the next four months, from May to August, and make a decision about the return then. Parents and staff will be given advanced notice of the decision. Commissioner of Education Kalmar Richards said, “Next week Monday, April 15th, M3 students from TN Tatem Middle School will report to Purvis Primary school; M2 students will report to Heron Bay and M1 students will report to the Hamilton Fire Station. Staff will also report to these sites. “As advised previously, students should pack snacks and lunch each day. “TN Tatem Principal, Mrs. Garita Coddington, will meet with M1 and M2 parents at 5:45pm on Monday, April 15th at Bermuda College to provide specific details of next steps. I urge all M1 and M2 parents to attend this meeting as specific information will be shared in reference to having M1 and M2 students transfer to other middle schools for the remainder of the school year. “M3 students will continue to report to Purvis Primary for the week of April 15th and 22nd, 2019. We have decided to keep the M3 students at Purvis until after they take the Checkpoint Exams. M3 students will write those exams on April 23rd, 24th, and 25th and we wish the M3 students all the best for their exams. “M3 students will also be transferred to other middle schools. The School Principal will meet with M3 parents at 5:45pm on Monday, April 22nd, 2019 to share specific details about this. “TN Tatem school staff will be assigned to schools as well, and Principal Coddington will meet with staff on Monday, April 15th to share the details of this plan. “All staff will be given some time to plan and prepare for this transition, which we hope will be a smooth one. “We hope that the transition to other schools will be a smooth one for students and staff. BREAKING NOOZE: School temporarily occupied by relocated TNT students are found to be infested with mold. David Burt declares national emergency and will rely on Arbitrade and Fintech to save the island. Why do they look so pleased with themselves in the photo? They have all failed. M1 students will report to the Hamilton Fire Station … wow, just wow. The PLP has had almost two years to sort TN Tatem out and what do we get – we get our children educated at a fire station? Fire the Education Minister, ha! Wow, what a mess. In most countries the education minister would resign, this is catastrophic for 184 kids. Or has your spin doctor got it covered? The spin doctor, has it covered,he/she will appear on the # 1 talk show and convince the sheep that all is wll.. and then blame the U.B.P. for the mess that they have created. Disruption in our children’s lives…again!! It happened too under OBA. Hhmmmm…WONDERING FOR WHAT LENGTH OF TIME NOW? Clearly, OBA could not have cared less….the demonstration of that was over and over again from 2012 to 2017. Get it right, P.L.P. ,for the people!! The OBA weren’t allowed to do much, given that rent-a-crowd kept blocking parliament. Your life would be much better now if you’d kept them in power. The PLP have been 25-11 for two years. You said the mold was gone and the schools were safe. You own it. The PLP did this. You have no one to blame but yourselves. The PLP are not for you or the people, just a few family and friends at the top. The people are there to vote and pay tax so the few can live in luxury. Send their kids to private schools, no need for buses as they drive around in Government vehicles, hire consultants so they don’t have to work. Lack of education will mean more educated foreigners coming here. Why don’t you care and get out and demonstrate? STRAIGHTFORWARD…and we all know that’s not true. WTF – Hamilton Fire Station as a temporary school??? I am so shocked… can you believe our children are being educated at a make shift room at the fire station ??? parents get out there and protest, why the hell are you putting your children at risk. Glad the wicked oba are gone. Everything gravy now, no school, no bus, no trash pickup but I’m gonna fly my kite down Shelly Bay and sit off ‘cuz tomorrow never comes. Minister needs to go,doesn’t matter who failed our children they don’t deserve this. But if it was under any other govt tweed furbert and the other hypocrites will be marching etc..
Premier show you care, axe the minister. Oh never mind probably travelling or moving all that gold. Ok, let’s assume that is true (and that the complaints from around 2005 were properly dealt with), why weren’t the the recommendations in the 2016 (not 2006) report carried out? Who ordered different measures to be taken and when? The OBA is the main reason we have these issues….the bus system went to hell because they weren’t concerned with the public sector. Most public money went to insuring that the America’s Cup went smoothly, buses from the East and West to Hamilton we’re always 1-2 hrs late regularly during their tenure. TN Tatem(Dellwood) was closed during the OBA’s tenure because they didn’t do their due diligence when it came to getting these schools ready during the summer period, because money from the public sector was going to the America’s Cup. We have a NEW airport that we don’t own, but the old airport had been getting a new face lift…new paint job (roof and exterior), new industrial air conditioning for the building, and the building hasn’t leaked in years(all under the OBA)….OBA are liars for the wealthy….and the supporters are just OBA puppets that live in a false reality…The PLP are not perfect, but they care more for the everyday Bermudian then the OBA ever cared. The bus situation was going on when the PLP where in power how many years ago. The oba aka UBP are the masters of politics why do you think we have a color problem in the 2 political parties. The UBP did some bad things to Bermudians in their time. They will always be the true players of friends and family $$$$$. So bad that they tried to change the #$%#$ NAME to oba. Lets not forget using surrogates to help get more votes. Indeed…the OBA, much like God, invented mold and then put in in the schools. Give just one, JUST ONE example of how the plp are “for the everyday bermudian. I’ll wait…….. Chronic School issues, busses that come late or not at all, one-day trash pick-up with Rats proliferating, Sugar TAX, a causeway with 2 temporary bridges that are near their life-span. Seniors with little money to live with, employees with paychecks that can’t make ends meet anymore due to inflation, taxes, and lack of proper wage increase. All I see are smiles coming from most politicians faces. It is NOT a joke! Handle the people’s money properly! Bermuda is not a paradise with all the stress we face now. Kites are not a help, not even a Doctor, since a Co-pay is almost $75 for a visit of 5 minutes. STRESS…..